As the starting "genesis" of the entire series, I wanted to produce something that is flexible, yet something that is not too considered "spiritual" as that is what's usually associated as the initial impression these two genres. If anything, my passion was to avoid re-creating and competing against what's on the shelves; but creating something of a tangible value that people can sink back to its' basic, sole reasoning & purpose of listening to these genres in the first place - finding a certain sonic environment where they can truly be at ease, and ultimately; relate to. Perhaps a possible, alternative way of "finding" themselves, a way of "self discovery". This is not by any means my very first attempt in making a compilation based on the above two genres. Back in 2007, a fictional concept project I created; Ellipsis - was the very first in tying together sonic composition together upon a contextual atmosphere. This concept revolves around a fictional branding idea of a fine-dining, middle-eastern / European cuisine establishment by the same name. That project' sole purpose was to sonically illustrate the atmosphere of all things 'exotic' not necessarily in the way of preparing, and tasting the dishes but essentially expressing the various atmospheres and cultures that projects the serene, deep and immersive dining environment of the venue itself. While the idea remained plausible, the effect and the result however to be quite frank - was neither competent in a way of mixing, nor is it technically plausible to within any acceptable margins of today's listening standards. Because the resulting sound was at times; would be considered too "spiritual" - as in not made purely for "casual" or "mass audience" listening; the difference between the two which I will explain further later below. So then, the following year quickly gone by which I had to question myself in a context of possibly improving that mistake: "What else could be more different than establishing yet another "chill-out" or downtempo compilation?" I had to somewhat, or somehow, put a different twist to this genre by allocating sounds that is flexible but also personal at the same time. But at the same time, I had to make a commitment that this should not sound too spiritual. Distance and loneliness were the two prime contextual events of Destination : Yours as is evident in the original version completed in 2009. But the original product by itself - was later self-admitedly mistaken as something that's taken seriously too far, detached and too "spiritual" sounding (especially towards the end of the set composition) . The 2013/2014 5th Anniversary edition ensures that a more broader, "casual" mindset of the audience is kept as the secondary demographic in mind. Project Ellipsis: originally crafted as a portfolio university piece of work but later re-adopted as a personal compilation design - the earliest attempt of tying a sonic set composition together with a context; as an experimental framework of an idea "in-the-rough". The self-directed brief was simple - re-create the sonic atmosphere to best reflect the dining atmosphere behind the concept fictional dining venue "Ellipsis". Much of its' results; while still amateurish and technically detached at times - nonetheless became the backbone of the later development and subtle references for Destination Yours original version and the 5th Anniversary Edition six years later. Then came a moment in middle of 2008; a theme and ideation was first established. The first, initial prime goal was to sonically illustrate the two keywords "Distance"; as it is the physical context, and "Loneliness", as the emotive context. In its' early inception, Destination Yours was envisioned to be designed and treated close to that of a beloved "gift", that one would physically send to a special someone or an individual; in an environmental context that is both foreign, and far away from the sender's origin. A journey of sonics indicating one place; a transition of one group of feelings to another. Something that presents a linear dimension of someone's volume of life's experiences; from out there and eventually leading back home. I sincerely thought that this must be what other numerous downtempo & chill out compilations try to accomplish, as one singular goal. But surprisingly, very few has maintained that focus from beginning to end. Much of all the existing commercially released compilations all indeed have qualities that are well chosen, selected, designed, etc. But only in sections. Or parts of it. Or in minute ingredients of achieving towards that goal; but never fully "gets" there. But so far I was confident that too many strive to collect and simply brand their each of their compilation as the "best of the best" almost everytime. Certainly works in the name of profit, but perhaps not for the sake of originality. If there is one thing I do subtly find about downtempo & chill-out genres as a whole - it always makes an attempt to communicate something about a possible "journey". I'd like to call this self-discovery; because each and every song in a compilation beckons your attention to see how that song relates to you; in any way, any emotion, in any form, in any aspect. I sincerely believed that from day one, if I could convince the listeners to be able to immerse and "find" themselves in a section of a compilation; then my intended goal in that compilation is ultimately fullfilled. Everyone has an ability to find; just by listening - through audible inspirations that brings them true feelings of being at either what they would call or consider "home" or simply a complete solace in an environment that is wildly different than where they are currently in. Throughout the one whole year invested in the first version, as it was completed in 2009 - I was only halfway satisfied, but decided to make do with it as it was. Only until I have confidently crafted my Principle that I was able to make a complete revisit to this project; hence titled the 5th Anniversary edition - to fully gave itself a final resting place in early 2014. Many of the so called downtempo & chill out compilations tend to be quickly and immediately filtered and judged by the public to fall under one of two opinions/impressions - either that album could be played in front of a group of people (mass/audience listening), or entirely for personal / solo listening (inspirational/spiritual). The first and latter group are the most common to find on the shelves; as they are quite often released by countless record labels as nothing more than to keep maximising profit. The other however; could very well be appearing on the mainstream shelves from time to time, but their sonic qualities would likely to be regarded as elusive, but unfortunately can easily be thought as too "spiritual"; and this, may distract a few listeners. The main goal was to find a set of inspirations that doesn't hold itself purely within the comfort zone of yet another chill-out compilation aka., made for group/audience listening; but really to acquire as many inspirations from other places to increase the sonic elusiveness of this project further. Elusiveness not for the fact it sounds "generally good" as background listening for everybody else in the room, but "relative" enough so that ONLY a few can relate to it, one song at a time. Simple enough as it is to describe this as a goal, but very difficult to coordinate and filter what sounds the most intuitive and inspirational among the rest. The very first of such inspiration I drew upon was simply no other than Jose Papilla's 8th instalment of the series Cafe Del Mar (Ocho); mixed by Ben Cherrill, and Luke Neville). Released back in 2001, it projected something that almost everybody; either new to or as a seasoned follower / veteran of the genre - something unusual and unexplored. Its' overall sonic signature was considered as many miles-transition away from Jose Padilla's tried and true classic approach of selecting and maintaining the beloved balearic tone. Critics and reviews worldwide gave it a mixed result. Some loved it. Some hated it. Some were even convinced to no longer support in buying the next future titles; as quickly evident from reading through Amazon®'s customer reviews. Cafe Del Mar; Volumen Ocho, (Manifesto Records, 2001.) : 13 years old, but the sounds still ever so relevant, contemporary and elegant. On this eighth instalment - it represented the first ever downtempo and chill out title to have made an attempt to drift away from a basic, go-to holiday compilation but instead - an intimate sonic journey towards something that sounds altogether insightful and "personal". But there is something within it that no other Cafe Del Mar's I have certainly heard and personally collected (every number prior & and many afterwards) - the set composers really know how to design and curate work of sonics in a way that it sounds "personal", much further away than it simply being a background holiday music. And certainly almost no other Del mar titles afterwards (after the venerable failure of Volume 10; which deemed to be too spiritual and numerous titles thereafter; which many sounds cheaply fit for corporate office background music) - that are as deservedly right and as rightly emotional. Thus, for all its' intent for a more personal, private listening; Cafe Del Mar Vol 8 remains the perfect backdrop of inspiration for Destination Yours - something that is neither kept too sacred or too simplistic and predictable. It distinguishes itself away from all other products simply because it sonically communicates upon the needs of its' audience; almost on an "individual-sounding" level, rather than immediately attracting the common listening needs of a group which quite often sounds predictable. However, when one perceives a relaxing compilation that sounds any of slightest level of being "personal" - it must be taken with caution that too much of this may detract away from the overall sonic openness and "flexibility". This was simply my one biggest failure of the very first version (besides from the very unrefined mixing) ; completed in 2009 which left me completely unaware of its' severity until late 2012, then; whilst in the middle of developing the next title - that I decided to look for more inspiration. 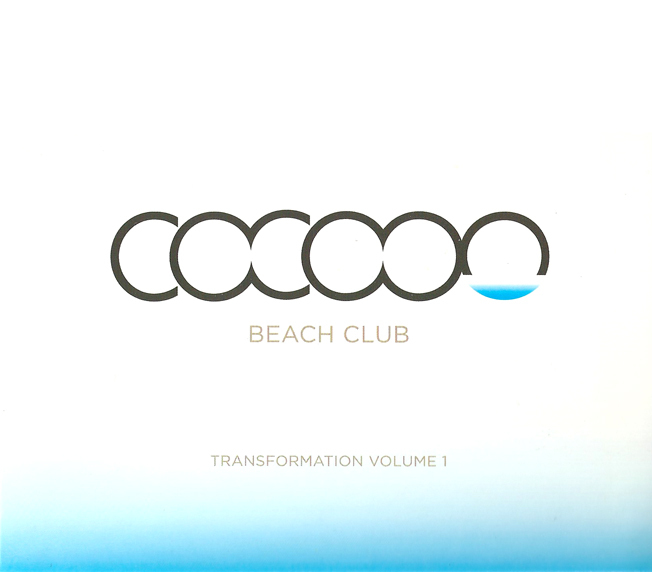 Cocoon Beach Club (Seminyak, Bali) Volume 1 / Transformation mixed by Tony Montana. if there is one genre within dance music that is unexpectedly flexible, then it has to be Nu-Disco. Inspired by the sound of "sunset tropics" in the south east, this compilation has instilled within me a permanent belief that it is possible for such commonly misportrayed genre to deeply immerse and inspire; rather than to excite & "wake" the listener. Blue Six's 2010 Noesis and 2008's Re-Creation; the last of two great releases of Naked Music. To recognise and personify the meaning of distance; one should also include an intimate, humane attachment to it. If there is anything that needs to be said about Naked Music NYC or any one of my favourite record labels - it's their relentless approach of theming, cohesiveness and consistency of all their releases. A good compilation which communicates the sole theme of "distance" also deserves some influence that communicates on the sense of longing, and intimacy of another being far from your existing environment. Whilst very few have effectively touched upon this subject of our needs non-precariously without sounding too obvious, mundane and predictable - almost any of Naked Music's downtempo releases have remained long embedded in my list of go to artists for such inspiration whenever a lighter soul of funk can further attract a broader listening demographics. Intimate yet not conservative; bold yet sensitive; these are what best effectively best describes the essence of Naked Music NYC's label. In 2008, I have made my first attempt to have made this as visually "convincing" as that of a final tangible; commercial product. Not tangible as in simply amateurly printed and placed inside jewel covers. But tangible enough as a concept as well as an idea. My evolution of interests in graphics are not always linear (although the essence and value of good and best design however, can be traced back to two essential creative cores - intuition & discipline); and thus from this I'd like to take forth a journey completely where I have never gone before. That was terrain modelling & rendering. An entire year was spent in learning and self-training on two software packages (Terragen & Vue's, the latter of which became the platform of choice) as well as purchasing (yes, out of my own money) legit version upgrade including all the necessary add-ons and modules. That journey was more than a dozen occasions proved to be challenging enough to bring anyone down to their knees. Dozens of hours of learning and watching tutorials, multiple dozens more in developing that idea to reality. What started out as a small, concentrated composition, one after another, then gradually - a larger image forms as one connected piece. A hundred & few dollars, and one & half years later - an idea crafted out of nothing, to a complete story created out of nothing. From conceptual to photographic: whilst the previous mini planet concept is no longer the "hero" carrier of the theme, I've decided to forego the planet design as a secondary highlight of visual interest; as the emphasis is to introduce the viewers to the clean re-branding, literal image driven philosophy of Moment; not to further re-illustrating what is already done. To elaborate upon the meaning of distance, I have tried to illustrates as much of the keywords "diversity" and "mother nature" into one composition. Whether it be landscapes; manmade or otherwise; along with two lone figures / characters - the man and the dog; which can be seen as a minute detail in the layout. However, to really connect all these elements of "diversity", there is one thing that we must not forget; everything of our own emotions, and conscience - is created out in whollistic respect and reference to history, and science itself; which is where the "core" genesis of everything else therefore - are illustrated in the centre piece. During the re-branding of the MOMENT project; I also have decided to take a major change in its' primary pictorial method of coverage. The purpose was to introduce as much of the logo's presence as possible; preferably against a pictorial canvas that is not too detailed or complex as to compete one another; but a well chosen photographic canvas that still relates well to the each title's subject and context. This remains to be the style that is to be hopefully seen as the consistent format for all future concept title/s. All impressions are of hypothetical semi-final conceptual renderings towards a favoured mainstream Digipak® format. Matt-laminated throughout front & back, CD design shown as reflective etch foil on premium pearl white base surface.